Here's a late Christmas gift from me. Also an homeopathic remedy for all sorts of holiday substance abuse. This is the recipe for home made nutella. 1 cup of toasted hazelnuts. 1/4 cup of dark cocoa powder. 1/2 a cup of powdered sugar. 3/4 of a teaspoon of vanilla extract. 3 or 4 tablespoons of vegetable oil. Put the nuts in the food processor and mix till they become buttery. 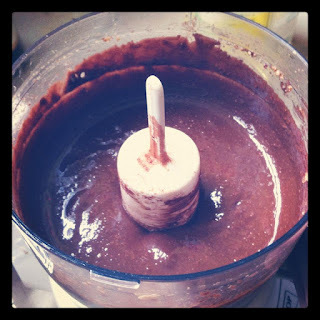 Add the cocoa powder, the sugar the salt and the vanilla extract. Mix some more. At this point add the oil and keep mixing till you reach the creamy consistence we all know and love. It can last up to two months in the refrigerator. Realistically, I give you a couple of days.